Making it to the gym is hard enough (your bed is just so cozy)—don’t make getting out the door even harder by scrambling for your gym clothes and equipment in your morning haze. 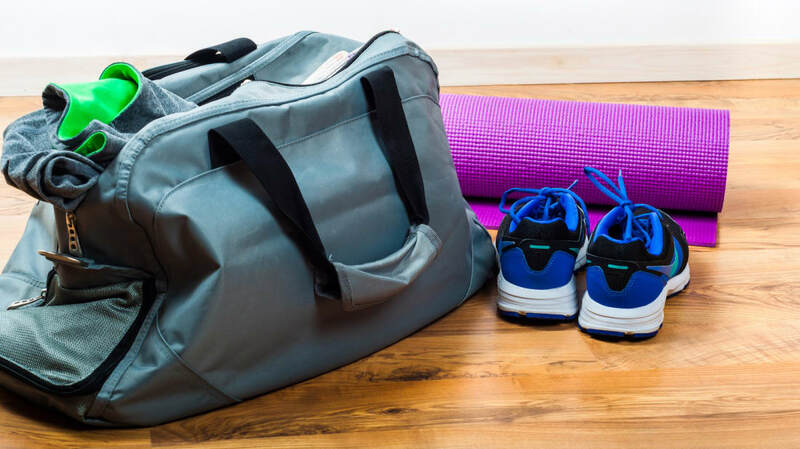 Keep a bag packed full of these expert-approved workout essentials handy in order to take the guesswork out of your sweat sesh. The gym not your thing? We’ve got you covered, too. Our experts recommend all the equipment you need to get a solid workout in at home (no treadmill required). Let’s start with the basics—you need a sturdy bag to hold all your gear. "A strong duffel bag with plenty of side pockets" is a must, says Jade Pearman, a studio manager and instructor at F45 Training in Dee Why, Australia. Most gyms provide towels, but sometimes it’s nice to have your own. Pearman says her go-to is "small, soft, white, and fluffy." "It’s all about softness and smell!" she says. "I’m very particular in making sure my towels get washed with 'washing softener' and hung outside to air. So when I put that towel to my face during a sweat, blood, and tears workout I’m able to find a little bit of comfort." Chris Barnes, a head coach at F45 in Surry Hills, Australia, adds that his has a small zip pocket for his keys. When it comes to buying sneakers, everyone has their preferred brand (Pearman’s is Under Armour, Barnes’s is Adidas). But no matter the make, fit is key. "I am in sneakers all day long, so I need a shoe that’s supportive but as close to being bare-footed as possible," Pearman says. It’s easy to go down the rabbit hole when looking at the water bottles available today: glass, plastic, insulated, sports-top—the options are endless. Barnes says he likes to keep it simple: "I have a plastic sports bottle with a team brand on it—it’s BPA-free," he says. Barnes says a starter set of dumbbells of different weights should do the trick for your home workouts. For weight training, Pearman prefers kettlebells (or TRX bands, if available to you) to dumbbells. "We need to bring more pulling movement patterns into our exercise regime and less pushing exercises, as the majority of us have overactive pectoral muscle, which make us very rounded through the upper back," she says. "We need more work through the traps combined with more stretching through the chest muscles." Feeling sore or tight from your workout? Using a foam roller for myofascial release is "a great way to de-stress at the end of the day, as well as a great tool to use to enhance sleep," Pearman says. "I could give you 100, if not more, reasons why these are great to use," Pearman says. "Stretching, strengthening, mobilizing, or activating muscles pre-workout. Band walking is a favorite of mine—it’s a great way to activate the glutes before a workout!" Mats aren’t just for yogis. While a yoga mat will do the trick (for stretching and strength training) if you have one, Pearman says to otherwise look for a "thick but firm" mat that is about half an inch thick. Pearman tells us a medicine ball is "great for adding a bit of resistance when working the core." She recommends holding one while doing Russian twists or wood choppers. You don’t need fancy equipment for at-home workouts—you can often easily use a chair or stair instead of a bench or step in a pinch. But if you plan on doing most of your exercising at home, it’s worth buying the real deal. Planning on going straight to the office (or meeting up with friends) after the gym? Dry shampoo is a lifesaver when the shower line is too long. "Dry shampoo is an absolute godsend!" Pearman tells us. "It’s impossible to not sweat through the scalp during a workout, and impossible to wash the hair every day. Dry shampoo is probably an item I could not do without." Throw a pack of cleansing towelettes into your bag in order to instantly refresh after your workout. While they're made for your face, there’s no shame in wiping down your underarms, too!